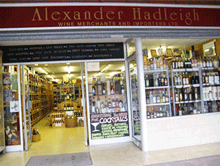 Wine Merchants | Delivery options to USA, UK & Channel Islands. Zone 11 USA & Canada (Check Restrictions )Due to US regulations wine can only be delivered to a recipient with an Export/Import Liquor License. We cannot ship spirits (hard liquor) to the USA. Deliveries are between 8:30 am to 6:00 pm and will typically be within 3 - 4 working days for the UK, 4 - 7 working days for Europe and 6 - 10 working days for the rest of the world. The individual States within the USA have varying alcohol laws, please check before purchasing that you or the recipient are able to receive delivery. We cannot make refunds once the goods have left our premises for a delivery address in the USA. Delivery times can vary during busy times such as Christmas and in severe weather conditions. If you or your recipient are not home all day, then it may be advisable to use a friend or relations address who will be home all day, or a work address if possible. Different countries have varying alcohol laws which can affect Duty and Taxes, please check before purchasing that you or the recipient are able to receive delivery. We cannot make refunds once the goods have left our premises.